4 Easy Crafts To Sell Now! If you are looking for some easy crafts to sell, then there are some great, simple options for filling up your craft stall or online shop. Creating quick and easy items to sell alongside some more complicated crafts can be a perfect solution to fill some empty stall space. Simple crafts that are relatively inexpensive are great as add-on sales, which can really boost your income at the end of the day. Simple items such as cards, brooches, door hangers and bunting are great 'extras' to sell with your other craft projects, or even as stand-alone items. The following are some great items to make if you have space to fill at a craft stall, you are looking for easy crafts to sell as add-on items alongside other crafts, or if you are just starting out and want some straightforward projects to begin selling as quickly as possible. 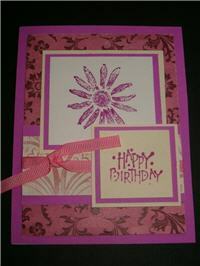 Handmade cards - Cards are a great add-on item and with well chosen embellishments, they can be relatively easy to make. If a customer approaches you to purchase another item, then offer them a handmade card to purchase with that item. This works especially well if the customer is buying a gift, but an easy, inexpensive card might also catch their eye and be too good an offer to refuse! Felt and fabric brooches - There are countless ways to make felt and fabric brooches, but the key thing to remember with these items is that they are quite simple to make. What makes brooches great, easy crafts to sell is that they can be prepared with off-cuts of fabric from other projects. That makes them inexpensive, thereby keeping the price down and making them ideal to have on your site or craft stall as the perfect impulse purchase. Door hangers - Like fabric brooches, door hangers are an item that is straightforward to make and can be a good way to use up fabric off-cuts that might otherwise lie around unused. These are simple to make and they are another item that can be sold at a relatively low price point, making them easy crafts to sell and perfect to accompany another larger purchase or as an impulse buy. Bunting - This is yet another great thing to make to use up left-over materials from other projects or an easy craft to sell and make from scratch. Bunting is a decorative item that can be made with fabric, paper, cardboard or even wooden board. Simply cut a rectangular or triangular piece, fix it to binding tape or paper tape (depending upon the material you are using) and hang for a festive effect. This is easy to sell, great if you are just getting started online or a charming filler item for your stall at a craft market. Preparing easy crafts to sell provides you with a way to increase your turnover as a crafter. It can be a good option if you are just getting started selling crafts, both online and offline. Each of these simple crafts can be made using materials left over from other projects and can be sold at a relatively low price, making them great space fillers and for encouraging impulse buys both online and at craft fairs. With the right preparation and planning, these simple crafts to sell could make a significant difference to your craft income.